Daniel Craig as James Bond looks fantastic! Every man wants to be him. Every woman wants to be with him. He's got the guns, gadgets and gals! He sports the tuxedo, drives the fastest cars, and has a license to kill. James Bond has always been an iconic figure and it makes perfect sense to continue a franchise of video games based on this character. Quantum of Solace is the first game specifically made for next gen consoles, and this game certainly does not disappoint. 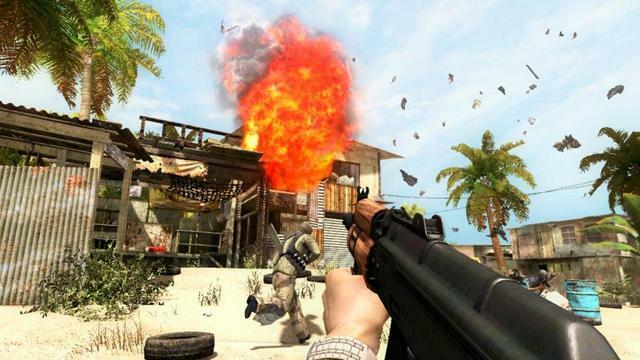 The James Bond video game franchise has certainly had its share of hits and misses. On the one hand, home runs such as Goldeneye and Everything or Nothing engross the player in a world of espionage and action, keeping the gamer on the edge of his seat. On the other hand, when a game strikes out, like The World is Not Enough and Rogue Agent, the gamer is left feeling like Moneypenny does every time James Bond promises her a night of excitement, and yet leaves her with her passions unfulfilled. Fortunately for us gamers, Quantum of Solace leaves us very satisfied. The single player aspect of this game is fairly basic. It combines two theatrical features (Casino Royale and Quantum of Solace) into one storyline. In the game, James Bond is brought to life by the voice acting of Daniel Craig. There is a visually striking resemblance between the in-game Bond and Craig that Treyarch really captured. This immerses the player into the game, allows the player to feel like he is playing the part of the world's most famous MI6 agent. 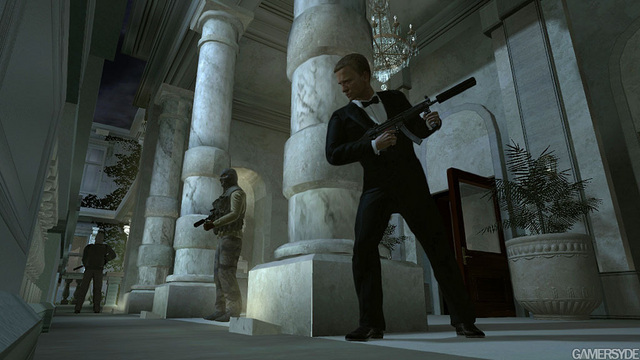 The stealth aspects of the game and the oft-used cover mechanic in the third-person perspective reinforces the idea that you are, in fact, James Bond. You will be able to use the full James Bond arsenal in navigating through the game's levels, either proceeding with guns blazing or by stealthily using a combination of your silenced pistol and physical takedowns. The world of James Bond cannot fully be experienced without exotic locations. Quantum of Solace fill this need by placing the player in the gardens of a huge mansion, an airport in Miami, the streets of Venice, atop a hotel, and within the well guarded walls of a casino. The voice acting is fairly average. Besides the previously mentioned benefit of having Daniel Craig reprise his role as Bond, Judi Dench joins in as M, along with Eva Green as Bond's love interest, Vesper Lynd. The graphics will not take your breath away, but by no means will they cause a distraction to the gameplay. The audio is also fairly basic, with your standard gunshot and explosion sounds. Again, nothing to detract from the game, but nothing to get excited over either. The multiplayer is where Quantum of Solace begins to thrive. Like most shooters, this is where a player will spend the most time. It is essential, therefore, that the creators put enough thought into this aspect of the game. 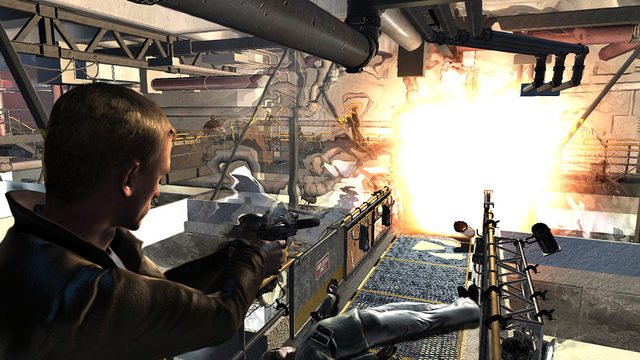 Quantum of Solace benefits greatly from utilizing the Call of Duty 4 engine. The controls feel right and the multiplayer just works. Most of the levels have obvious forethought and are designed intelligently so as not to allow for any cheap gameplay. Respawns occur at random areas and there aren't any specific spots that players will rush off to in an effort to gain a tactical advantage (unless of course you're playing Territory Control). 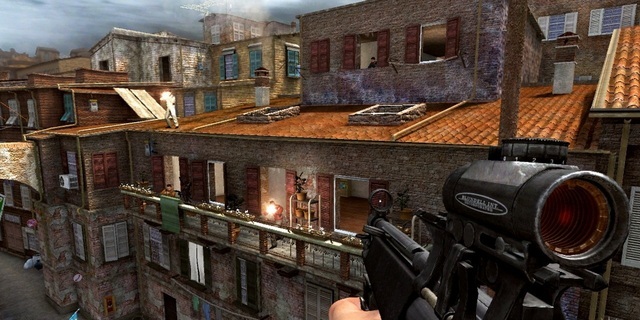 Besides the standard Deathmatch and Territory Control modes, unique games have also been included, such as Golden Gun (a single weapon with unlimited ammo that kills in one shot) and Bond Versus (pitting the MI6 agent against all the other players with Bond's goal being to disarm bombs spread throughout the level). Getting kills and taking objectives will net the player credits which in turn he can cash in for upgraded weapons, gadgets, armor, power-ups, and abilities. Coupled with the vast array of weapons to be had, this results in extending the life of this game greatly. This game is sadly overlooked due to the existence of big names such as Call of Duty, Gears of War, and Halo. If it weren't for the fact that those games had garnered so much attention at release, Quantum of Solace would probably have received the credit that it rightfully deserves for being a solid game. Regardless of that, over 2.5 years after its release (at the time of the writing of this review), Quantum of Solace still has quite an online following. This just underscores the fact that gamers desire to play as the greatest spy in the world. Bond... James Bond.